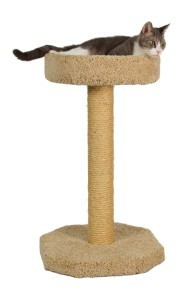 Buying an Scratch Post for Your Cat? Read This Guide First! A scratch post for your feline is your friend. Especially when you have expensive furniture. In this guide to scratch posts, we´ll discuss the ins and outs. This way you can decide which one you should buy. Maybe you wonder why you need a designated scratch post for Mr(s). Mittens. It seems like such a simple item. Yet, having one (or a couple) of these items around the house can save you big time. There are a couple of reasons why you should invest in designated scratching areas. For your pet’s health. Scratching things is how cats keep their nails in top shape. And not only that, scratching is also a great exercise for your kitty, and a way to reduce stress. Make sure your pet has somewhere to scratch without worry. It reduces the stress levels of both you and your feline. For the sake of your furniture, drapes, and upholstery. (And your stress levels). The way most newbie cat owners discover scratching items are quite essential. Cats love to scratch, and will scratch anything. That includes your leather couch. Setting up proper scratching areas can help divert the cat’s claws from your furniture, to his furniture. Simply setting it up might not be enough. Train your pet to use the scratch post. You can do so by putting catnip on it. Kitten treats at the top of the scratch post can also help correct this behavior problem. If you have a newly adopted cat or kittens: A scratch post provides a wondrous activity to help kittens get rid of their excess energy. It also gives them something in your home to attach themselves too. This makes it easier for the kitten(s) to adjust to their new surroundings. It also helps deal with any behavioral problems that might arise with being in a new environment. Tip: Hang extra items for the kittens to play with from the scratch post. This will encourage the kittens to play with it even more. 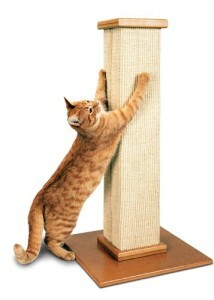 What to Look For When Buying A Cat Scratch Post? Scratch solutions come in a few varieties. These things come in so many different varieties. So many different sizes, shapes, and materials. When choosing an essential accessory like this, it’s best to think like a feline. We’ll point out valuable tips and advice so you can decide which scratch post best suits your needs. Make sure you buy a scratching item that is large enough for your feline. When a cat starts to scratch, he/she reaches upwards and then pulls down against the post. The post should be roughly 1.5 times the size of your feline. This will allow him/her to stretch out. The taller and sturdier a scratch post is, the more chance you have of your pet picking the designated scratching item over your couch or chair. The sturdiness and stability of a piece of scratching furniture, matter more to a cat, than the material of construction. It is very important for the item to be stable and sturdy. If the designated scratcher doesn’t stay upright, the cat can’t scratch to his or her’s desire. This will leave Mittens looking for better scratching options. Wooden or sisal solutions must be thoroughly attached to a strong and sturdy base. The base has to be big and heavy enough, so it won’t wobble when kitty starts using the item. If you have a wobbly post, it’s usually an easy fix: just nail it onto a larger base. This provides more stability. Cardboard solutions that lie flat on the floor have to be large enough. Your pet has to be able stand on the post and scratch at the same time. Felines that spent a lot of time outdoors usually use wooden fence posts, trees or tree stumps to sharpen their front claws. If you let your cat roam free outside, or your he/she has previously spent a while outside, he or she might want a scratching post from wood. You can either pick up some logs or firewood stumps yourself, or invest in an ready-build scratching solution from natural logs. When bring in wood from outdoors, check thoroughly for insects & other unwanted guests. This corrugated cardboard scratcher won the 2014 Fancy Cat Magazine #1 prize. Kitties love it and you can buy it on Amazon. Economical and practical, while (usually) not the most aesthetically pleasing, these scratching posts made from corrugated cardboard appeal to many cats. And they’re easy to replace. The higher quality ones often come with a toy of some sort, to encourage your cat to scratch at the pole. Cardboard scratchers are usually the first choice for new cat owners. They’re cheap and easily replaceable, but might not be the prettiest solution when it comes to cat furniture. They usually need replacing within a few weeks to a couple of months, depending on usage of course. Might not be heavy & sturdy enough. Another popular option constitutes of posts covered with rough sisal rope. Sisal covers the same purpose as tree bark would do outside. The sisal provides good grip for the front claws. The cat pulls downward and releases the sheath. This exposes the new claw underneath. These scratchers are slightly more expensive than cardboard ones. But they’re also far more durable and can last for years, before needing replacing. Cats love using these posts covered in sisal. Make sure you get a non-painted one. The paint can be toxic to your pets. If the sisal begins to look messy, trim it with scissors to make it look nice again. In this category, we recommend the Smartcat Ultimate Scratcher. It’s the #1 best seller on Amazon with over 4.000 positive reviews. Carpet is another favorite of the pet supply industry. We, on the other hand, don’t think this is a good idea. While carpet does serve the same purpose as sisal, it can resemble carpeting found on staircases or floors. Not all felines may take notion of the difference between their scratch post or your staircase carpet. Many won’t actually. If you want your felines to to stop wrecking your stairs and floors, it’s best to switch over to a different material. But if you do not have any carpet in the house, these scratchers are a viable option. They’re sturdy and durable, like sisal covered ones, but can be more pleasing to the eyes. If you do want a carpet solution, we recommend going half carpet/half sisal, like this one from Molly & Friends. Cats might not understand the difference between the carpet on their scratching item and the carpet in your house. Can be toxic if painted. Where to place the scratch post? Where you decide to put the scratch post, plays a big part in your pet’s acceptance of his new designated scratching area. When a felines scratches something, he/she leaves marks for other cats. These territory markers are both visual (the scratches) and scented. Other felines are now aware they’re in someone’s territory. For this same reason, many cats choose a prominent chair or table to scratch. This is how they let other felines know immediately whose territory they are in. That’s why it is important to place the designated scratching item in a prominent, often-used, location in the house. Sometimes it will even help to put the designated scratch item directly in front of the piece of furniture your feline has chosen to be it’s scratchers. 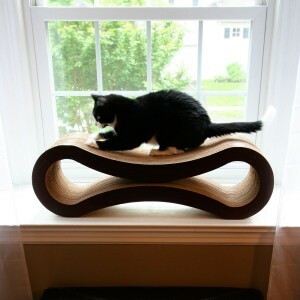 Put a little catnip or toy on the scratchers to encourage Mr. Mittens to start scratching at his new piece of furniture.